Rafael Nadal who is the current number one ranked tennis player in the world can now say he is a winner in poker. 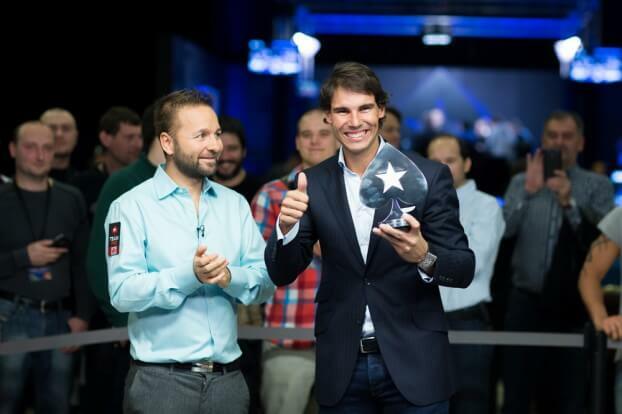 Nadal has emerged as the winner of the European Poker Tour (EPT) Prague charity challenge. He was able to beat the likes of Brazilian football legend Ronaldo as well as the number one ranked poker player in the world Daniel Negreanu. The charity challenge has been dubbed as the best gathering of sporting professionals at a poker table. Nadal, Ronaldo & Negreanu were joined by Ukrainian footballer Andriy Shevchenko, Italian skier Alberto Tomba and Dutch Olympic field hockey gold medalist Fatima Moreira de Melo. The prize pool for the charity event ended up at a cool €100,000. Nadal had the following to say after he won the charity challenge. I played for the first time in a live poker tournament and it was a big honor to play against a lot of stars around me, some in sports and other ones in poker. I had fun and I enjoyed it, and I felt a little bit lucky that I finally won. One of the big turning points for Nadal during the event was being able to knock out Daniel Negreanu. Negreanu had the following to say after he was knocked out by the tennis legend. Nadal played a solid game and he didn’t make any mistakes. He knew when to make adjustments, to play more aggressively and he did. It was good fun, and the bottom line is that everybody wins, because all the prize money is going to good causes. Nadal will be donating the first place prize of €50,000 to The Good Hand Project which is a charity that supports helps young people get back to work.